Atari Jet Fighter. What's the score? This this when I started a game, the scores didn't reset to '0' for either player, when I scored some 'hits' on the other Jet the score moved in an odd sequence something along the lines of 2,3,2,6,4,11. Out comes the operation manual and my printed schematics. The scores are initially generated by two identical circuits comprising a 7493 binary counter, Pins two and Three which are linked to the 'START' signal are used to reset the counter to zero when the game starts. Pin 14 is the counter input which is pulsed when either Jet is 'Hit'. The output pins hen count upwards to a maximum of 15 and pass on to some more circuitry. After playing a few games I noted the following... the score was being reset every time a game was started, just not to zero, and it was actually counting, just not in a sequential order, I made the assumption that these two counters would not be the issue as having two different IC's fail at the same time was improbable, If one of these had failed it would seem more likely that one of the scores would stop working and not both at the same time. The 74157 at location A5 receives the signals from the two 7493 counters. I used my logic probe to test the pins of this IC. Pin 1 was pulsing away as expected and the input pins were all the in the same logic state as the output pins from the 7493 counters. 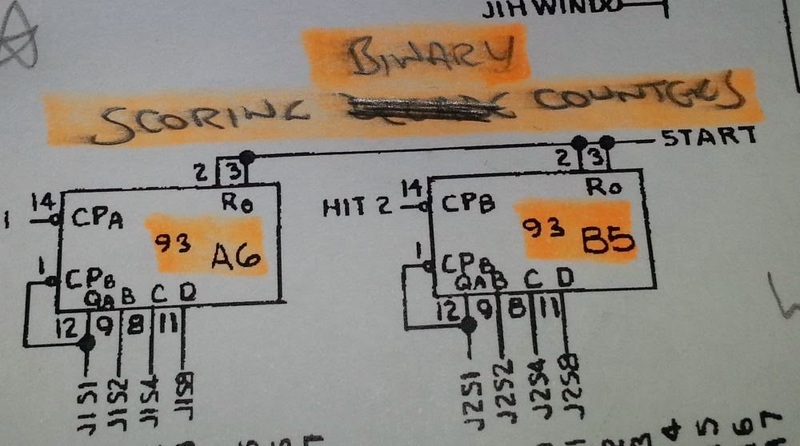 There are four output pins used which feed into a Prom which selects the Score number data, by my testing, pin 12 which is output 4Y on the datasheet was stuck high all the time. Quickly piggybacking a new 74157 cured the scoring, but did seem to have a side effect of resetting the game a short while after stating a new game. Anyway once socketed, I put in a new 74157 and we're back to fully working again. My IC tester confirmed that output 4 of the IC was faulty.